Our soft landscape skills encompasses bulk excavation, filling, topsoiling, cultivation, tree, shrub, ground cover, herbaceous and bulb planting together with mulching, turfing, grass and wild flower seeding operations. 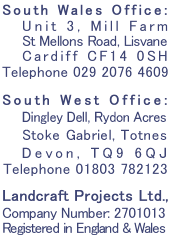 Our staff are fully experienced in all aspects of soft landscape works. All new staff members who are involved in soft landscape works participate in regular in house training sessions until they can demonstrate good plant knowledge. These training sessions concentrate on plant identification but also aim to give a thorough basic understanding of the plants that are regularly used within commercial landscape schemes, the conditions that the plants will tolerate, their eventual size, pruning requirements and the like. Within our management team we have staff members who have gained considerable experience working for commercial wholesale nurseries prior to joining Landcraft. This plant knowledge combined with our in house training ensures that our clients can be confident that if they choose Landcraft as their preferred contractor, they will receive a professional service that is second to none. Sir Robert McAlpine chose Landcraft for the soft landscape works around the Wales Millennium Centre, Cardiff Bay. Take a look through our completed soft landscape project details and you will appreciate the scope of the soft landscape works that we undertake. Please also take a look at the current soft landscape projects that our teams are working on.